TEHRAN (Tasnim) - French President Emmanuel Macron is considering banning all demonstrations on the Champs Elysees after "yellow vest" rioters wrecked the iconic Parisian avenue last weekend, an official from the president's office said on Monday. On Saturday, protesters related with the "yellow vest" movement burned down the famous Fouquet's restaurant on the Champs Elysees as well as several newspaper stands, a Longchamp luxury goods shop and vehicles. Following Saturday's riots, that were reminiscent of violent clashes last December on the Champs Elysees between protesters and police, Macron summoned a meeting with the interior and justice ministers on Monday, Reuters reported. Macron has promised to take "strong measures" as soon as possible to prevent riots happening again next Saturday. 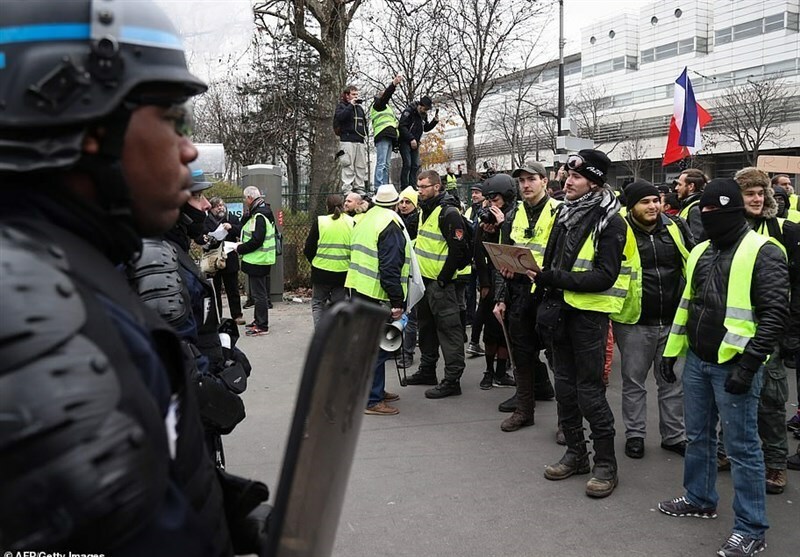 Since mid-November, the "yellow vests" protesters - a group that originally demanded fuel tax cuts but has since morphed into a general opposition movement against the government - have held demonstrations every Saturday in the French capital.